Amir Khan was in a funk. Months had gone by since he faced a game but limited Samuel Vargas in September, and now the time had come to contemplate his next move. But he found it hard to think about his future when there was that nagging sensation again in the pit of his stomach. Khan had defeated Vargas, of course, by a wide, if pedestrian, decision. It irked him, however, to discover that all anyone cared to talk about after the fight were his foibles: knocked down in the second round by a right hand, Khan absorbed another right in the tenth that sent him into a spasm. The Vargas fight was in some ways reminiscent of the Julio Diaz fight in 2013, in which Khan was decked early on and eked out a split decision. Khan beat Vargas, yes, but the story was once again about his erratic ways. Then one day, as he was mulling his options, a downcast Khan got a call from Billy Keane. Keane was an old friend from Khan’s Wild Card days when he trained with Freddie Roach. A Hollywood careerist who acted in bit television roles over the years, Keane had made some inroads in the barrier-less world of boxing. He helped negotiate fights for Julio Cesar Chavez Jr. and most recently was caught trying to lure super-middleweight David Benavidez away from his promoter Sampson Lewkcowicz over to Top Rank. Keane, in other words, was your typical boxing middleman. Keane called to commiserate. “‘I know exactly how you feel,’” Khan recalled Keane telling him. “To be up against these ‘Vargases’—for them, it’s a once in a lifetime opportunity. . . . For you, you’re just going in there and you know you’re going to beat Vargas. . . . For you, all it takes is one little slip-up and people are going to start putting you down.” Keane was speaking Khan’s mind. “In a heartbeat,” Khan replied. Against Crawford, Khan knew he would be the clear underdog and, hence, all the more motivated. Then there was also this psychological safety net: there was no shame to be had in a loss to one of the best fighters in the world. “Let me see what I can do,” Keane said. Shortly after that, Keane reeled in Top Rank boss Bob Arum and the parties negotiated. Crawford, for his part, balked at his initial opponent for his next date, Luis Collazo, and was unwilling to sign a contract. 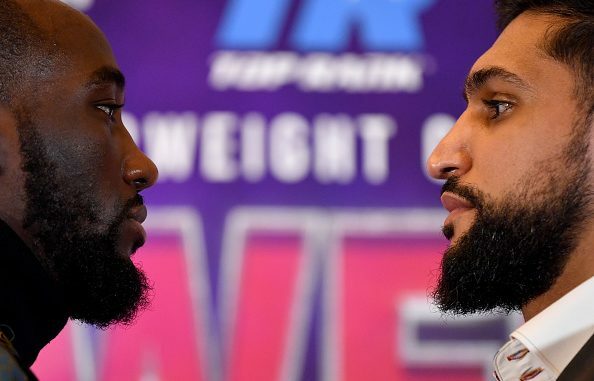 Aware that his last two opponents—Jeff Horn and Jose Benavidez—were underwhelming, Crawford wanted someone with more heft and credibility, in name, at least, if not necessarily in talent. Khan fit the bill. Eventually, both sides struck a deal to have Khan face Crawford on April 20 at Madison Square Garden on ESPN PPV. Pragmatism has never been a strong suit of Khan—and unless fate has decided to impose a gentler outcome for the British thrill-seeker, he is in store for a world of hurt on April 20—but only the most miserable schlubs would claim that fighters who play it safe are the reason why we tune into a prizefight.